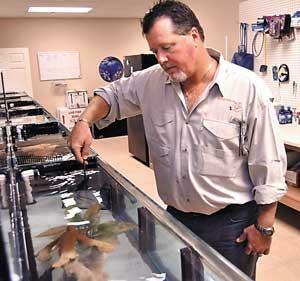 Warehouse space isn’t just a production area for Bottled Ocean Inc. — it’s a rehabilitation center. But not for people. Rather, the Orlando-based custom aquarium/coral maker, maintenance and sea-life rescue firm needed to make sure its space was large enough to accommodate eight 55-60 gallon tanks for sick or injured fish to get better, plus separate coral tanks. It also has a table that’s used to pack tropical fish going out to customers or to unpack foreign fish coming in from other countries. The firm moved to a 3,000-square-foot warehouse in east Orlando six years ago after hurricanes Charley, Francis and Ivan destroyed its former space near Orlando Executive Airport. Though its current space is smaller, it’s more suited to the work it does, said President and CEO Greg Lund. The company didn’t need to focus much on choosing colors for the warehouse space — the tropical fish provided most of that. Instead, needs included making sure there was space for hospital tanks as well as the boat the company uses to collect sick or injured fish and other small sea creatures. Once rescued, the creatures are treated and then put into separate quarantine tanks before they are delivered to ­customers. Along with that, the company receives shipments of tropical fish for its custom residential and commercial aquatic systems from places such as the Philippines, Fiji, Hawaii, the Florida Keys and Haiti. The climate control in the warehouse has to be ideal to adjust to the high humidity indoors and outdoors, Lund said. To view original article, visit: http://www.bizjournals.com/orlando/print-edition/2011/01/07/for-bottled-ocean-inc-its-all-fishy.html.